Two generations ago, Americans went to a strange land to fight a strange war. In many ways this war's rules ere much like the French & Indian War more than 200 years before. In this war, a small group of soldiers met a people who would have been at home in the Americas of 1750. These people were the Dega. They were not Vietnamese. They differed in language, culture and religiion. They were pushed out of the fertile lowlands into the central Highlands. In these mountains, they wanted freedom to continue their hunting and primitive farming lifestyle. They wanted to be left alone. This couldn't and didn't happen. Their homelands were of strategic value and these people were excellent warriors. Each of the warring sides sought their allegiance but the Montagnards chose to ally themselves with the Americans. they fought side-by-side with us for more than ten years. During these years, the Americans who knew the Montagnards formed strong attachments to them as individuals and as a people. When these Americans, both military and civilian, left Vietnam, their attachment to these people came home with them, but the "Yards" were left behind. The were left alone to face the full fury of the North Vietnamese Army. They and their children still face this fury today. In 1986, U.S. Special Forces Vietnam War Veterans formed the General Coactive Montagnard Association, Inc. (GCMA). Later, the name of the organization was changed to Save The Montagnards People, Inc. Better known today as STMP. In order to broaden recognition of the people we are trying to assist. Within the constraints of IRS public-charity 501-C3 regulations, we may also advocate for the survival of the Montagnard culture in Indochina. From the beginning, it was known that the Dega would need assistance in two (2) broad areas. First, assimilation to the life in the United States and second, the preservation of their culture. The people who knew them in their homeland understood that to go from jungle foot trails to 4-lane highways or from forest garden patches to supermarket shoping would be a huge adjustment. The STMP mentors knew that although the Dega were quick and eager to learn, the transition would take time. Help has been provided in all ways - from job placement to medical costs and educational funding. This help was always available to all Dega, not just selected groups or for a brief period. Our organization continues to attract veterans and civilians who did not serve with these brave people, as well as Montagnards who wish to make the dream of reality. We know that that without the love and sacrifice of the Montagnards, many more Americans names would be engraved on the somber black granite wall in our nation's Capitol. Since our beginning we have always been 100% vounteer and unpaid. This means there is a continuing responsibility for many of our members who carry out day-to-day operations, but because they care, this allows all the money we raise to be used for the benefit of the Montagnard People. "They were there for us then, Are YOU here for them now? According to the political anthropologist Walker Connor, The SRV Vice Minister of Culture proclaimed in 1976: "It is necessary to eradicate all outmoded customs while gradually bringing the new culture to each ethnic minority. The state has the duty to bring new progressive culture to these people in order to build a new culture with socialist objectives and Vietnamese National Characteristics". All Bibles and reading materials written in the Montagnard languages were burned after the Communist took over. 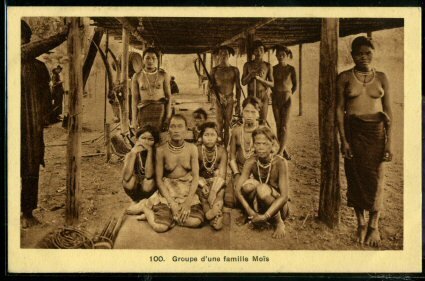 The trival languages could not be taught in schools and today many Montagnard children only peak Vietnamese. Ancestral homelands have been seized, relligiion is prohibited and traditinal Montagnard villages dont exist any longer. The Americans who worked with the "Yards" in the Highlands understood the price they would pay, and as a result they were the first to welcome them to their new life in America. Those Montagnards who finally made it to the security of America had fought their way through Cambodia and Laos to camps in Thailand. Very few of those who left Vietnam made it to safety so a welcoming picnic was in order. ther have been three major immigrations to the United States -- the first in 1986 of about 250, about 450 in 1993, and in recent years Dega have come in small groups. Currently there are about 8,000 in North Carolina. STMP has been quietly working to get these groups safely to the United States and helping them acclimate once they are here. We belive that our work within the regugee camps in S.E. ASIAis as important as our work among the governmental agencies in Washington, D.C. Since the majority of Dega live in Central North Carolina, the largest part of the "hands-on" assistance falls to our members and friends who live in the area. But their work would never be possible without the dedication of people all over the United States. the Dega have received outstanding short-term support from local groups, but STMP has been and will continue to be the long-term support group. the established Dega Associations and STMP will be with the refugees for as long as they need our help.